A children’s literature class Anita Wade took as an undergraduate led to a passion for literacy that she has since shared with her family and community. Photo by Bradley Slade. I love the saying “There’s no app to replace your lap.” Even in this digital age, I find that nothing is quite as enchanting as a children’s picture book. Kids of all ages love to sit and turn pages of colorful artwork and lose themselves in a story. My profound love of picture books and reading to children developed in a children’s-literature class at BYU. I also took a storytelling class and learned how to breathe life and excitement into the simplest story. 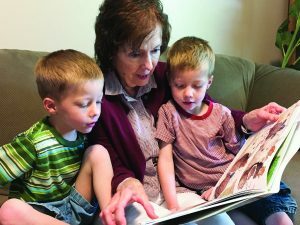 While I enjoy reading to my children and grandchildren, one of my favorite opportunities has been serving as a story-time volunteer at our local library, exploring the wonderful world of poetry and picture books with eager toddlers and preschoolers. Once a tiny 2-year-old girl toddled to the table of books, saying, “Book, book.” I lifted her onto my lap, and together we looked through a book as she described the pictures. When she’d had enough, she went back to her mother, who later apologized for her daughter bothering me. I assured her that there was hardly anything I loved more than enjoying a book with a child. While we were both at BYU, my sister asked me to take a chorale class with her. Even though I’d had little training and it didn’t fulfill any requirements for me, I signed up for the class so we could spend time together. I’m naturally a soprano, but I decided to sing third alto so we could sit together. When we began singing, I was totally lost and struggled to know if I was singing the right notes. Over the semester my sister and I reserved practice rooms in the HFAC, and she helped me learn the alto parts. By the end I finally began to feel more confident. We even performed in a concert. It was amazing to be one of the many voices united in a glorious sound. Many years later, after I had moved to Connecticut and started a family, I attended an Eastern Connecticut Symphony Chorus concert. It was wonderful to hear a choir and full orchestra sing with such precision and passion, and I remembered fondly my time singing with the BYU chorale. Although I didn’t feel qualified, I decided to audition for the choir. I filled out the questionnaire and wrote in my one qualification: a semester of chorale training at BYU. At the audition I was required to sight-read. The conductor gave me a starting pitch, and the accompanist did her thing. I tried to relax and not overthink it. When I finished the conductor said I hit every note perfectly, and I was accepted in the choir. Now, after two years singing with the symphony chorus, music fills me up and inspires me in my daily life. Without my experience in one BYU chorale class, I don’t think I would have tried for this opportunity. —Bethany Park Jensen (BA ’01), Ledyard, Conn.